I have watched the series finale of NBC’s Hannibal. I know showrunner Bryan Fuller has talked about taking it to another network or online platform but I think he could easily leave the series as it is. The episode opens where it left off with Francis having just revealed to a kidnapped Reba that he is the Red Dragon. He puts Reba through a test to see if he can trust her to obey him by making her go downstairs and lock the front door. Because Reba is a smart person she uses this opportunity to try to escape. But Francis is waiting for her at the front door when she tries to run. He then sets the house of fire with Reba and himself still inside. However he can’t bare to watch her burn so he blows off his head with a shotgun. Reba is able to get the front door key off the body and crawl out of the burning house. We then go to Reba recovering in the hospital with Will Graham by her bedside. He reassures her that it is not her fault her boyfriend turned out to be insane and we don’t see any more of her after that. Will goes to see Hannibal to tell him that the Red Dragon is dead. Hannibal tries to keep the conversation going by commenting on how Will didn’t even really get to kill anyone. 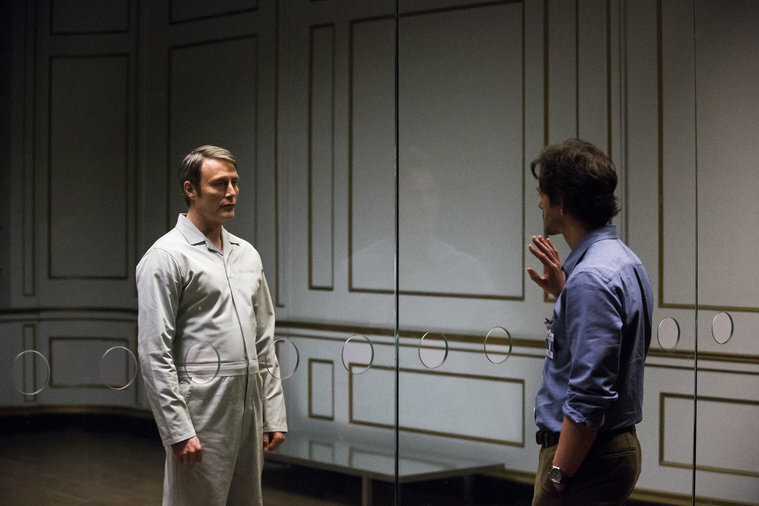 Will fires back that the reason he rejected him three years ago was to trick Hannibal into turning himself in. Then Will leaves and as soon as he gets to his motel the Red Dragon ambushes him. We then get a flashback. It turns out the FBI lab guys who are not Beverly Katz figured out right away that the Red Dragon faked his death. 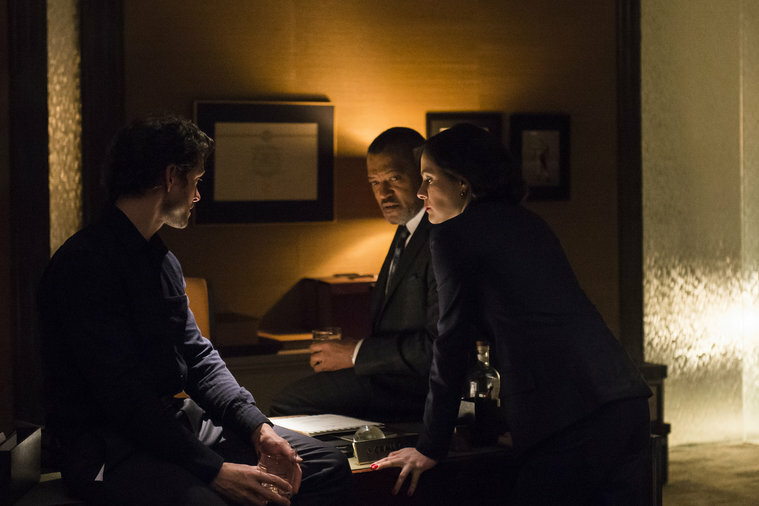 So Will, Jack, and Alana come up with a plan to lure the killer into a trap using Hannibal as bait. Basically they are going to move him into federal custody and fake his escape. Francis faked his death and burned his house in order to protect Reba from the dragon and by doing this he says he has become stronger. The dragon no longer threatens to overtake him, now the dragon is part of him. And it seems part of his becoming now involves killing Hannibal Lecter. There is a lot of build up that takes up most of the episode before the plan goes into effect. Alana Bloom visits Frederick Chilton in the hospital. He is receiving skin grafts and wonders if he can get some from Lecter once he is dead. Alana says that she wants to remind herself what Hannibal is capable of. But Chilton is not letting her off the hook and reminds her that it was she and Will that put him in this state. Will has one last therapy session with Bedelia and warns her about what is about to happen. Bedelia does not take it well and starts drinking. She understands better than anyone that Hannibal has a way of turning things to his advantage. Will reassures her that he intends to put an end to Hannibal once and for all. Bedelia does not buy it and goes back to drinking. With no comfort left to give Will warns her to pack a bag and flee before Hannibal comes for her. Hannibal agrees to take part in the plan but only if Will comes back and asks him for help. 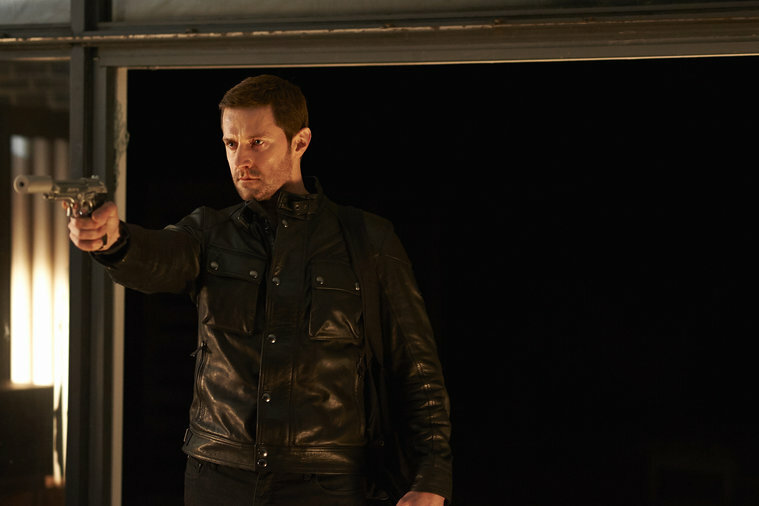 Meanwhile Alana knows that she is on Hannibal’s list if this all goes wrong so she departs the Verger estate with Margot and their son to parts unknown and that is the last we see of her. They begin transporting Hannibal to the location where they will set the trap for the Red Dragon and things immediately start going to hell. Francis ambushes the caravan and kills a bunch of agents but then hangs back and leaves Will and Hannibal alive. Hannibal notes that the dragon will want a more intimate setting for what he has planned. Hannibal takes one of the remaining police cars and drives up to get Will even saying “going my way” and with no other options he goes along. Hannibal takes Will to a cliff-side house where he took Abigail and even Miriam Lass, remember her. The ocean has slowly been eroding the cliff, one day the whole area will fall into the sea and the house will be gone. We see Jack Crawford one last time as he arrives at the scene of the ambush. Once again Jack has attempted a risky complicated plan to catch a killer and once again it has blown up in his face. At the seaside house Will and Hannibal share some wine. Will admits that he intends to watch the Red Dragon transform Hannibal like he did to his other victims. They know they are being watched and a moment later Hannibal is shot through the stomach and his wine bottle shatters. At first Will just stands there watching. Hannibal even compliments Francis on his becoming. Then Will tries to strike but ends up getting stabbed in the face. Then Will and Francis proceed to stab each other with the same knife a few times before Hannibal gets in on the fight. However the Red Dragon is far more than a match and starts beating the crap out of Lecter. Will stabs him again but still he can’t take down the dragon. Then Hannibal grabs an axe, now he and Will are both armed and they can take down the dragon together. At this point “Love Crime” by Siouxsie Sioux starts playing during the scene and its kind of perfect. Working together Will Graham and Hannibal Lecter are able to slay the dragon. Francis falls to the ground dead with blood pouring out into the shape of his imaginary dragon wings. After the fight Will and Hannibal are both exhausted and probably bleeding to death. Hannibal embraces Will and tells him this is all he ever wanted. Will returns the embrace and a moment later they fall off the edge of the cliff into the ocean together. The credits begin to roll over the image of the ocean beating against the cliffs. But this is not the final image of the series. We then see Bedelia Du Maurier sitting at a dining room table with fancy spread. The main dish is some kind of roasted… leg. And of course the camera pans back to Bedelia and she is missing a leg. We see there is an empty seat at the other end of the table. There are a lot of ways to interpret this final image. I like to think that Bedelia lost her mind and cut off and cooked her own leg as a preemptive middle finger to Hannibal if he ever does come to claim her. Lets take a moment to talk about things. Yes the shows television run is over. And I think that’s okay. Yeah Bryan Fuller has a list of shows that never got to their full potential but I think Hannibal is one that did. I think this was a perfectly fine ending to the journey of these characters. And with a character like Hannibal Lecter it might be better to quite while you are ahead. I trust you are all familiar with the term Mary Sue. Everyone hates a main character that is a Mary Sue. Well there is something I hate far more than that, a Mary Sue villain, and I think that is what Hannibal will become if this show keeps going. 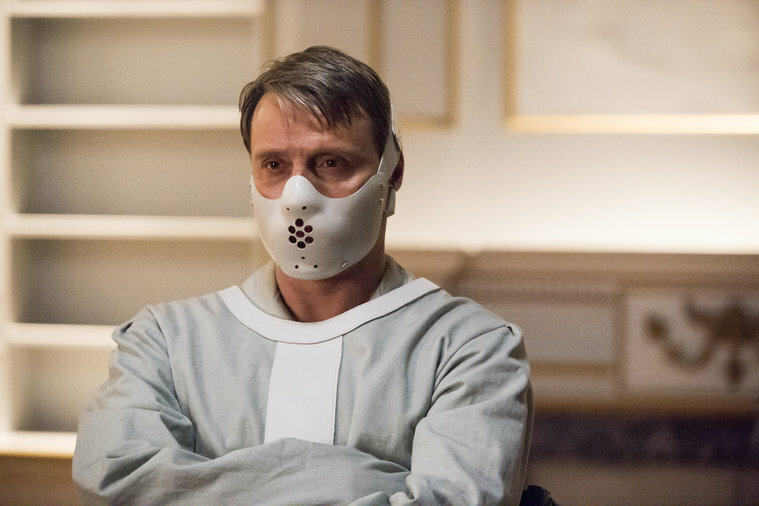 Hannibal pretty much did become a Mary Sue of sorts in other media. Maybe I am wrong and Byran Fuller has some brilliant story yet to tell with Hannibal Lecter that will not turn him into the most superhuman special awesome snowflake cannibal ever. But I think as things are now this can and should be the end. In my own personal head-canon Hannibal and Will died in the ocean, their bodies eaten by sharks and other fish so their remains are never recovered and the rest of the character spend their remaining lives looking over their shoulders wondering when Hannibal the cannibal will walk back in the room to terrorize them. Farewell Dr Lecter. Until we meet again in some other media reboot of your lore.